Not all ambassadors come decorated with ribbons and medals; some live in our midst quietly and with humility doing work that promotes peace and justice. Irish Network Colorado (INCO) is pleased to present its first annual Ambassador Award to Noel+ and Tammy Cunningham, two such diplomats, for their tireless efforts via the Cunningham Foundation on Thursday, May 2, 2013, 5-8:00 pm, the History Colorado Center, Denver. Former Governor Bill Ritter, a long-time friend of the Cunninghams, will introduce Tammy and showcase the work of the Foundation. “The INCO Ambassador Award Gala is an annual event to honor those of Irish descent and friends of Ireland who have fostered business, social or civic relationships between the US and Ireland, or who have devoted their time and resources to promoting philanthropic causes in Colorado and around the world,” said Ciaran Dwyer, INCO President, “We are thrilled to be honor Tammy and Noel with our first annual Ambassador Award.” The Cunningham Foundation was founded in 2003 with the mission of helping the courageous people of the impoverished areas of Ethiopia to help themselves. The Foundation is the vision of Noel and Tammy, who were struck by both the poverty and amazing resilience they witnessed in a visit to Project Mercy in Yetebon, Ethiopia nearly ten years ago. The Cunningham Foundation supports Quarters for Kids, Hope Bracelet and Hope Heart Beads projects, and Ethiopia Libraries. The Morgan Adams Foundation raises money and awareness on behalf of children affected with cancer. Working with leading physicians, the Foundation directly funds pediatric cancer research and therapies which will improve survival rates and reduce the devastating side-effects cancer treatments have on our children (for more information go to http://www.morganadamsfoundation.org/). “We are so touched and pleased that Tammy would think of us with respect to the award being given to her and Noel. Noel was a very special person in Morgan’s life and to be included in an evening that celebrates him and Tammy and their work is truly an honor,” said Joan Slaughter, Morgan’s mother and co-founder of the Foundation (along with her husband, Steve Adams). Ticket reservations are underway and limited, with prices at $75 per person/$145 per couple. The cost of the ticket includes a tour of the History Colorado Center (12th and Broadway), a hors d’oeuvre VIP reception, and the award ceremony. Ticket reservations can be made through www.irishnetworkco.com. Irish Network Colorado (IN-Colorado) is a business network that connects Irish expatriates, Irish-Americans and friends of Ireland. Our mission is to provide a forum for social, business, and professional networking for our members and to strengthen economic, social, and cultural ties between Irish and American businesses in Colorado and more broadly between the U.S. and Ireland. By harnessing the energy and synergies of its diverse membership, IN-Colorado hopes to strengthen the economic, social, and cultural ties between Irish and American businesses in Colorado and between the U.S. and Ireland. Denver Rose Jessica Lesser (pictured above) will be one of the World Champion and Professional Irish Dancers at the Roots of the Rose: A Show of Irish Celebration, Friday April 26 at the Tivoli Turnhalle at Auraria campus. The show will benefit the Denver Rocky Mountain Rose of Tralee Center, a not for profit organization. Proceeds will help to send Jessica, the 2013 Denver Rose, to Ireland at the end of May to compete in the regional finals of the International Rose of Tralee Festival with 6o other cities from around the world. Other performances during the evening include Dr. Marcin Arendt, virtuoso fiddle Player and wife Rebecca , a world class singer, and the Michael Collins Pipe Band. In addition there will be tickets sold for drawings for great prizes! The Pikes Peak Genealogical Society and the Pikes Peak Library District will present “Cornish Hard Rock Miners in Cripple Creek and Leadville” on April 22, 1-3pm, at Penrose Library , 20 North Cascade, Colorado Springs . John James, from Truro, Cornwall, England, will discuss the 19th-century migration of hard rock miners from the Cornwall Peninsula, on England’s southwest coast, to the mines of Colorado, particularly Cripple Creek and Leadville. John James is a retired land management officer from Cornwall who is active as a mentor and assistant for an RAF cadet squadron stationed near his city. He has a strong interest in the culture of the American West and the Cornish diaspora of the late 19th century. Every year in April approximately 100 participants representing a wide range of backgrounds gather on the University of Colorado’s Boulder campus to participate on 200 Conference on World Affairs panels, performances, and plenaries. All CWA sessions are free and open to the public. The Sixty-fifth Annual CWA, April 8-12, 2013, will host several visitors from the Emerald Isle. Clare Muireann Murphy is a performance storyteller, social entrepreneur, and writer who has contributed significantly to the development of storytelling in the West of Ireland and performed all over the world, including at the Globe Theatre London, the Esplanade Theatre in Singapore, and Dramatikkens Hus in Oslo. 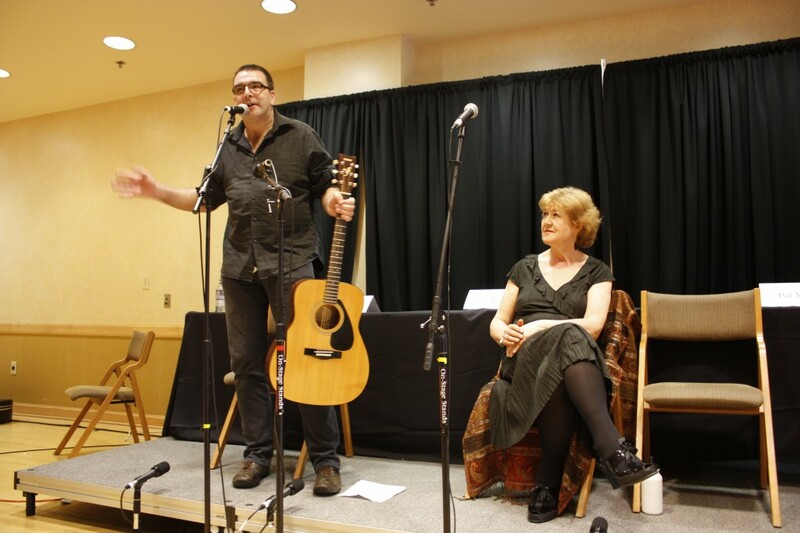 Feargal Lynn, also from Cushendall, is a folk singer and storyteller, who plays guitar, tin whistle, and bodhran, and has contributed to radio, television, and storytelling festivals. Lynn is a qualified psychiatric nurse and manager in elder care, and has worked various mental health managerial roles, including extensively with homelessness, addictions and employability. Ireland is a great country to visit at any time, but this year is special. 2013 is the year of The Gathering, a nationwide grassroots effort to lay down the green carpet for the entire global Irish family. The Gathering will be bringing people together from all over the world to celebrate their Irishness, heritage, history and culture. Altogether there are over 2,000 events planned including, but definitely not limited to, music festivals, sporting events, clan gatherings, food fairs, and literary, stage and screen festivals. To make a long story short, whatever month you arrive in Ireland this year, and whatever county you find yourself in, there will be something amazing going on. 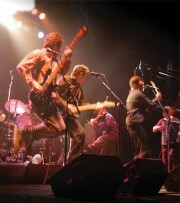 Catch unique events such as Riverdance—The Gathering in July; The Kilkenny Arts Festival in August or The Dublin Fringe Festival in September. There are almost as many ways to enjoy a vacation in Ireland as there are Gathering events. That’s because there is such a large Irish family outside the country (there’s four million or more in California alone) and over the decades Ireland has learned very well how to look after its returning sons and daughters and any new family members they might bring with them. In terms of accommodations, Ireland boasts thousands of Bed and Breakfasts, self-catering opportunities, small hotels and guesthouses as well as many superb city center hotels and hotel resorts dotted around the countryside. You can even stay in several castles! There’s something to suit, whatever your budget or your travel requirements. 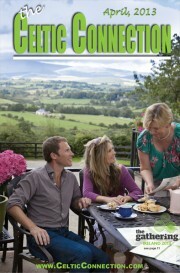 Bed and breakfasts have long been a favorite in Ireland because they offer so much flexibility. You could be at the Galway races one day, staying in Salthill overlooking the majestic Atlantic shoreline, and decide the next to take a drive down to the Lakes of Killarney. Driving distances and times are very short in Ireland, nothing is very far from anything else. In the time it takes to drive between San Francisco and Los Angeles you can easily get from Belfast, the northern capital, to Cork City in the South. That’s a big reason why the B & Bs are so popular, they allow you the freedom to roam wherever you want and whenever you want. And it’s not just a stay at a B&B that’s unforgettable—the hearty Irish breakfast you’ll have every morning is famous world-wide! Vacation rentals, or holiday homes are in plentiful supply. I have stayed in a few and have never been disappointed. They are a great way to go if you’re planning on entertaining friends and family. Hotels in Ireland have been rated among the best value in Europe by Hotels.com and what better way to experience Ireland’s historic towns and cities than by basing yourself at the very center of them. Whichever option, or combination of options, you choose for your stay in Ireland you would be well served to visit www.ireland.com first. The official web site of Tourism Ireland provides advice on all aspects of your trip and specifically provides details and links to over 7,000 accommodations of all different types. Of course, your accommodation needs might be taken care of if you decide to use the services of one of the many tour companies that specialize in vacations in Ireland. Tours based on particular activities, cultural themes, or geographic locations are all available and worth looking into if you want to maximize the time you have to spend in Ireland. You can take tours around Ireland’s major attractions, tours around its stately homes and castles, cultural, historical and culinary tours. You can even take mini tours around its main cities. Hop on an open-top double decker bus around Dublin and you’ll see many of the capital’s unique landmarks—there’s the Guinness Storehouse, Dublin Castle, Kilmainham Jail and the vibrant Temple Bar area to name but a few! Golf tours are very popular. You can even design your own tour with some companies. Simply decide which of Ireland’s hundreds of fabulous links or parkland courses you want to play at and the tour operator will do the rest, tailoring your trip exactly the way you want it. Many of the premier tour companies operating in Ireland have special deals and packages which tie in wonderfully with the year of The Gathering. This year marks the 50th anniversary of President John F Kennedy’s visit to Ireland and many activities and events are planned to mark that historic occasion, such as the 50 mile Challenge in Sneem, County Kerry, and The Homecoming event in New Ross, County Wexford. 2013 is also a big year for Northern Ireland. The centuries-old walled city of Derry-Londonderry is the UK City of Culture this year and will also host Ireland’s biggest traditional music festival, Fleadh Cheoil na hÉireann in August. Another exciting event for Northern Ireland is The World Police and Fire Games, which will be held in Belfast in August. With 10,000 competitors, 57 sports and 70 countries taking part, these games are the second largest sporting spectacle in the world after the Olympics! The Titanic Belfast Visitor Center celebrated its first anniversary in March. It’s the world’s largest Titanic Visitor center, and showcases full-scale reconstructions and interactive exhibitions to tell the Titanic story. So whether you want to take advantage of the touring opportunities available or explore Ireland on your own terms this is the year to go! Valentine City Chorus, one of the best barbershop groups in Colorado, will pay tribute to the “Emerald Isle” this Spring with their “A Great Day for the Irish” program. They will perform along the northern Front Range from April 7 to May 17 (when/where below). “A Great Day for the Irish” show is published by the Barbershop Harmony Society (BHS), and offers a collection of Irish classics from over the years. The barbershop style singing will be performed by the Valentine City Chorus, the Loveland Colorado Chapter of BMS. BMS was formed in 1938 by Owen C. Cash to promote and preserve the America art form of barbershop music. Today, just under 25,000 men of all ages in the United States and Canada are members. Barbershop singing is an A Cappella style of singing that can be traced back to African-American barbershop in the late 19th century. It was popular in the early 20th century but stifled by the wild “Roaring Twenties.” With the efforts of BMH and help of musical theater and motion picture business, that sometimes incorporated the performance style onto stage and screen, barbershop singing made a comeback in the 1940’s. BHS described the Barbershop harmony: It’s music in a very pure form created with nothing but human voices coming together to create a rich and satisfying texture that is pleasing to the ears and invigorating to the soul. Whether you’re an experienced musician or a brand new musician, barbershop levels the playing field and allows you to find your voice and be a part of creating something that is greater than the sum of its parts. Throughout the year VCC can be heard at both private and public functions and are available to entertain for special events for families, companies, public groups, government organizations, schools, or anyone else that may be interested. Over Valentine’s Day the chorus breaks down into quartets and make themselves available to deliver personal singing valentines. During the Holidays VCC offer programs featuring Christmas carols and seasonal songs. They also donate their time for a benefit concerts, including one in May for northern Colorado public radio station KRFC FM 88.9. VCC also compete in the Regional Barbershop annual competition in Colorado “We have three active quartets within the chorus. At least one of them will be singing as a quartet in the fall competition,” said Lyle. The winner can advance to sing in the Society’s international competition the following summer. The unique sound of Barbershop harmony is loved and enjoyed by all ages, so gather your friends and family catch the infectious energy of the Valentine City Chorus as they sing traditional Irish songs in “A Great Day for the Irish.” Concert Conductor will be John Rotola, and Master of Ceremonies is David Thomas, international speaker and humorist. $14 – $16 – 970-962-2120 228 E. 4th St., Loveland, CO 80537. $16 – $18 – 970-350-9449	701 Tenth Ave., Greeley, CO 80631. Sugar Valley Estates (retirement) in Loveland on Tuesday May 7, 2013 at 7:00 PM (Free). Sunset Event Center in Ft. Collins to benefit public radio KRFC FM on Tuesday May 14, 2013, 7:00 PM. Lincoln Center – Magnolia Theater in Fort Collins , Friday, May 17, 2013 at 7:00 PM. $17 – $19 – 970-221-6730 – 417 W. Magnolia St., Ft Collins, CO 80521. For info on VCC go to www.ValentineCityChorus.com or call 970-667-0197.